Realistically, I will never buy a Bordeaux first growth with my own money again. Prices have reached the point where I can get several other expensive, great wines for the price of one bottle. Plus, the rush to feverish praise from writers who have tasted sample blends of wines that haven't been bottled yet -- and might not be the same when they are bottled -- leaves me wondering about the whole profession of being a wine critic. Oddly, as Bordeaux reds have found an endless river of yuan, Bordeaux's whites have disappeared from most wine lists. Bordeaux is not the greatest white-wine region in France: that's unquestionably Burgundy. For that very reason, and because millenials are bored by Bordeaux (can't say I blame them, as Bordeaux futures are, in the US, a fogey's purchase), Bordeaux whites can be great value. I recently tasted a half-dozen whites from the greater Bordeaux region; in other words, wines that are not from any of the famous sub-appellations. It warmed my heart that the two cheapest wines -- both under $10 -- were my favorites. These are not super-complex wines that will make you send a series of breathless tweets about (quoting a fellow critic from Maryland), "2010 Bordeaux is a great, great vintage -- not as great as 2005 or 2009 perhaps but great." (Grade inflation hits the word "great.") You'll note that I didn't cross the 90-point barrier on any of them, so no, I'm not going to say they're "great." 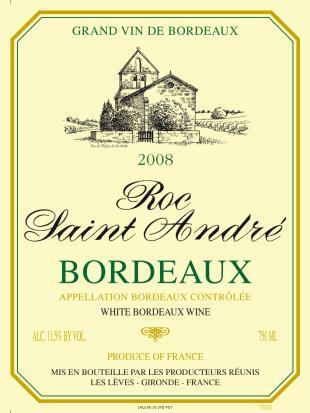 A good cheap Bordeaux white is a serviceable, drinkable, likable wine to have with dinner. Until I win the lottery, I need those more often than I need a "great, great wine." Maybe you do too. I wish I could say I can really taste the Gris in this, but I can't; it's green and grapefruity, with some weedy and herbal aromas and a hint of vanilla. It's like a New Zealand wine, albeit with the volume turned down. 13.5% alcohol. The winery is interesting; built in the 17th century, in 1832 it harbored one of the Bourbons who had come to stir an uprising. It was abandoned in 1870 and resurrected by current owner Jacques Demonchaux in 1970. Perhaps he liked it for the wooded 3-hectare lake in the middle of the property. 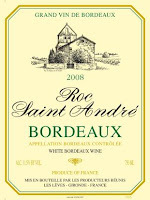 A classic Bordeaux blend of Sauvignon Blanc and Semillon, this is a great price for a simple lime-like food beverage. That may sound like a slam, but it's not: this wine does a job that people often want done. Just 12% alcohol, it won't blow you away but has a great chance of passing the empty-bottle test. Look at that price. France has more wine than it knows what to do with, and this is made industrially by a big company, but still, how does this get here on a ship in a bottle for $6? The importer takes a cut, the distributor takes a cut, the retailer takes a cut -- I'll bet this wine leaves the winery at less than $1 per bottle. And yet, it was my favorite of these 6 wines, offering crisp lime fruit with a slightly funky tropical note that adds interest, and a hint of grassiness on the finish. It's a fine fish wine with good balance between intensity and restraint. 12.5% alcohol. The mix of grapes is more interesting than the wine: 40% Sauvignon Blanc, 40% Sauvignon Gris, 15% Semillon and 5% Muscadelle. Perhaps it's the Semillon that gives it a grapefruit cream pie character, which is nice until a bitter finish spoils it. 14% alcohol. I'm not sure where these grapes come from because the winery claims to have only red grapes on its estate (please see new information in the comments). When I tasted it before dinner, I was unimpressed: its aroma is shy nearly to the point of absence, and I wrote "barely a wine experience, this wine is so simple, just plain lemon, that it's just a mouth rinse." I'm not sure why I went back to it while eating grilled fish, but once I did I kept going back to it, and ended up drinking half the bottle one night and finishing it the next. That makes it a difficult wine to rate: I doubt anyone will hate it, but it's a challenge to notice it. 12.5% alcohol. Even in Bordeaux, people make bubbly, which really doesn't make sense when you think about it. I think the world has come to an agreement that the best sparkling wines are made from Champagne grapes -- Chardonnay, Pinot Noir and Pinot Meunier bringing up the rear. Prosecco and Cava have their place, but they're not in the same league. So in France, the country of regional specialization, wouldn't you want your bubbly from places that grow Champagne/Burgundy grapes? There are plenty of marginal areas around Burgundy where Cremants are both cheap and decent. So why exactly would the Bordelaise want to plant Ugni Blanc and Colombard in their precious terroir to make bubbly? Seriously, look at the price of this wine. If it were $8, you could say, "It's a cheap bubbly for locals that somebody happened to export." But this isn't that cheap. And it's not that good. The texture is in between Champagne and lemon soda. It's refreshing and simple, sure, but you can do way better than that for less money from Limoux or Bourgogne. There's a violet sachet note in the aroma that smells like an old person's boudoir. And the bubbles on the side of the glass are huge, not attractive at all. It's not a terrible wine, but I can't think of a good reason to buy it. 12% alcohol. Thanks for reviewing white affordable Bordeaux. Sorry your first experience with Ch Ballan-Larquette was not so good. The blend is 50% Semillon 50% Sauvignon. Our estate is about 100 acres, about 80% reds, 20% white grapes. M. Chaigne: Thanks so much for clarifying. I actually drank the whole bottle, which I don't do all that often. Perhaps the next time I try it I'll know better what to expect. "...I doubt anyone will hate it, but it's a challenge to notice it." That's young Semillon for you. I bet it would be a different story if you tried it in a couple of years. Thanks for reviewing affordable and seemingly "good" white Bordeaux. I'm among the winebuyers that will most likely never purchase a bordeaux, as there are far too many great wines being produced elsewhere. I'll start with a case of the Roc St. Andre... for 70-80 bucks, even if I don't like it, I can bring them to bbq's this summer and someone will like them. Does anyone know the origin of the Kendall in Kendall-Jackson? Jane Kendall, Jess Jackson's first wife. They should make those wines Brettier, then they could charge more for terroir.